One-to-one appointments provide peer support and research skills development. The SOAR Centre (Support, Opportunities, Advice, Resources), is a free, peer-to-peer support service open to all higher degree by research and honours students, as well as staff. 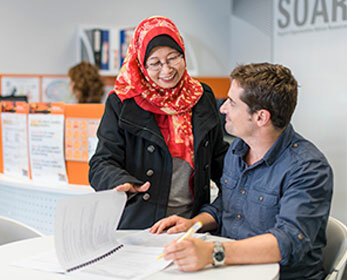 The SOAR Centre will help you become an active member of ECU’s research community. We support your academic and professional development as well as directing you to relevant training, resources and other ECU services. Our SOAR Ambassadors who are also higher degree by research students are available for one-to-one appointments and they also conduct small group workshops on a variety of topics to support you throughout your research journey. For more information visit the Support available web page. Located on the Mount Lawley and Joondalup campuses, our SOAR Centres provide a welcoming environment to connect with your peers whilst providing you with valuable support. You can visit a Centre for a quick coffee and catch up, or for a more extended discussion you are encouraged to book an appointment. Telephone, email, video conferencing or SKYPE is also available. Confidentiality is always maintained in the SOAR Centre as per ECU’s Code of Conduct. For more information, please download our SOAR Disclaimer.